I'd noticed my machine was running a bit laggy, so I ran two malwarebytes scans and found the following. I've also attached a hijack this log. I tried to run D.D.S., but after 15 minutes of it running without any progress I decided to kill it. It is actually currently hung on my system, and I cannot end the process via the task manager process lists, so I'll probably have to perform a forced shut-down. This is somewhat odd, I disabled Avast! and my firewall and cannot think of any other script blocking programs that could be interfering. Any assistance that could be provided would be appreciated. EDIT: I decided to also run a trendmicro root kit scanner. I doubt almost anything in it is actually a rootkit, but in the off chance I missed something I decided to post the contents amidst the other logs included. C:\Documents and Settings\Amun-Ra 13\Local Settings\Temp\IWantThis.exe (Adware.GamePlayLabs) -> Quarantined and deleted successfully. C:\RECYCLER\S-1-5-21-682003330-1035525444-725345543-1004\Dc56.exe (PUP.AdBundle) -> Quarantined and deleted successfully.
! !==Log 3 - Hijack This==!!
! !==Log 4 - Trend Micro RootkitBuster==!! 13 hidden registry entries found. No hidden operating system service hooks found. No kernel code patching detected. Do you use this program? Note: Close all browsers before running ATF Cleaner: IE, FireFox, etc. All items removed, and all cleaning tasks performed. May I ask why I was instructed to remove IObit? I rather enjoyed some of the system tools that came packaged with it. Also, yes I do use System Explorer. Just trying to get the performance back so anything that's running will make a difference. You still with me on this? We've only just started looking at this. My apologies, I am still with you. My reply was delayed by a serious system failure. A few evenings ago I was playing a game called League of Legends with some friends of mine. While running the program I also had skype up so we could chat with one another while playing said game. During the game my Skype account was disconnected, and the games screen cut to black. I still had audio of the game happening though. 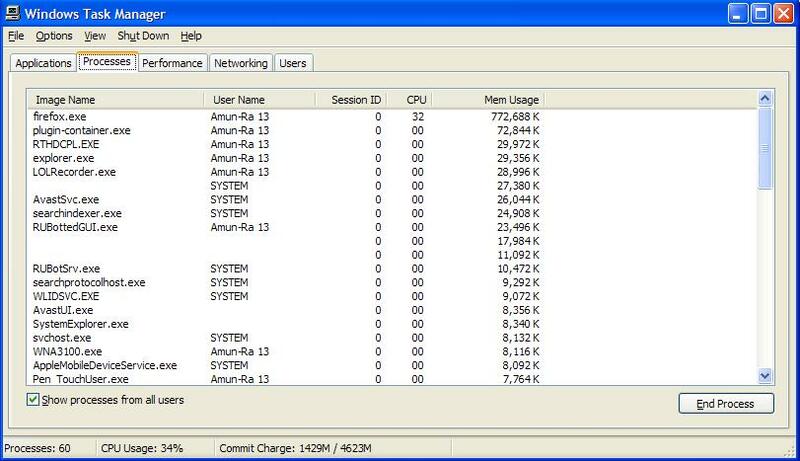 Deciding it best to close the process, I ended the games task in the task manager. While looking through the task manager I noticed several strange entries, attempted to take a screenshot of the events but recieved a blank error message informing me of something while the print screen failed to paste into a paint document. I've attempted to replicate what the screen I saw looked like with the image attached. Things got progressivly worse. While attempting to restore my Skype password (which was now for some reason inexplicably blank) I noticed that websites wern't fully loading. It got so bad I eventually had to kill the browsers I was using in an effort to get a better view of things. My desktop was acting tempramental, icons were discolored, and some were missing, others had black shadows encompassing them. I attempted to open a folder, and it looked like for a split second a folder was opening before suddenly it abruptly closed and another blank error message was displayed on my screen. I'd had enough of all this, and proceeded to manually shutdown the machine. I've booted it a few times in safe mode and tried to run malwarebytes, running a full system scan. Since I have alot of files I generally set it up and than leave it be. However, after attempting two full system scans the system seems to shut down in the middle of the scans for reasons I can't imagine. A quick scan revealed no infections, but a full scan might be best. I've managed to load up the machine in normal mode. Loading times seem slower than I remember them, but so far the strange system failures haven't started up again. Do these sound like signs that my video card / power supply is going out? I've been having some issues with both in the past, but am uncertain how such things would result in Skype crashing. EDIT: I have added the image file mentioned earlier and a collection of event log entries I found suspicious. You can Google those yourself like I did. Nothing appears to be bad. It really sounds like a hardware issue to me. I see, what sort of hardware issue do you think it is? A problem with graphics card / power supply / hard drive? I'm doing some searches myself and am having trouble finding what hardware is implicated by the described symptoms. Is it only when you're on the web you notice issues with picture, etc.? Have you tried both IE and FireFox? I generally am constantly on the internet in one way or another, so although it has surfaced only while I'm using a browser or playing an online game, I'm not sure if that is a good indicator of a correlation. The graphics card I'm running with is REALLY old, an Nvidia Geforce 8500, so I'm currently ordering in a newer model with a built in fan. After I get that installed in the next few days I'll be in need of your insight if the problem persists. EDIT: Also, I think the content loss has been occurring while using both Firefox and Google Chrome, but I never use IE so I have as of yet not seen if it also happens there. The content loss isn't confined to the browsers though, it also eventually results in "The Application Failed To Initialize Properly" errors. "The Application Failed To Initialize Properly"
That could be about anything. Does it give you a code number like: oxcoooo? It does, but it is hard to make out due to the obscuring of text. Lets see what happens with the new video card when you get it. Sorry for the delayed response, it has been hectic around here as of late. After installing the graphics card and fiddling with it's driver set things seem to be doing better. I haven't noticed any of the strange distortions to icons, and the "application failed to initialize properly" errors are no longer occurring. The system does seem to be a bit slower than I recall it being though, especially on boot up. I doubt that is the graphics card's fault though, probably some other system element getting bogged down.